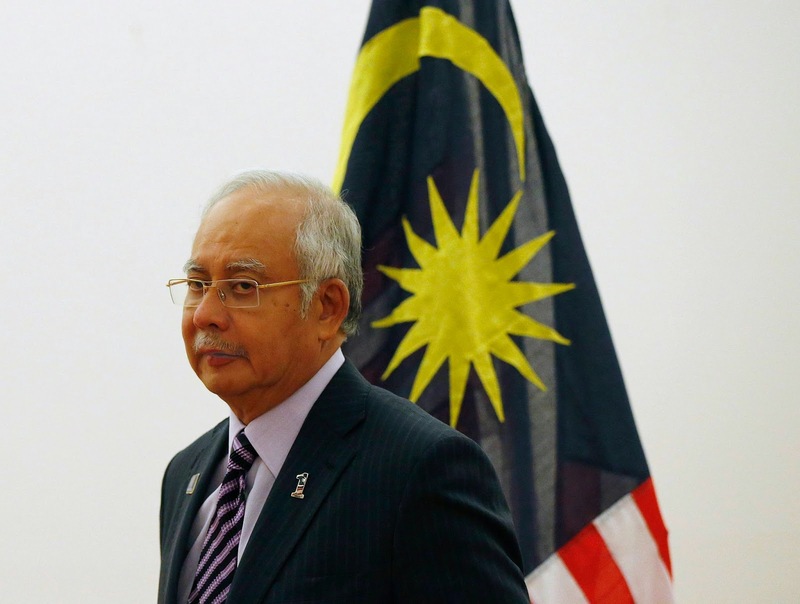 "...(Malaysia) achieved what pressure from far more powerful nations had failed to accomplish". Getting the job done. People who know Capt Nik know that he's not one to easily praise anyone or anything (bikes, included). So I sat up when I read his salute to Najib Razak over the PM's brokering for MH17. This was before Sahur time (I usually have sahur just before 5am) and I was reading hard between the lines to see if Xr Rider isn't being sarcastic! A Proud and Sad Event. Well Done PM Najib. You pulled it off. Quiet Diplomacy did it. No one can ever imagine the difficulties in dealing with forces at war in a country so far away. KUALA LUMPUR, Malaysia — Prime Minister Najib Razak’s announcement that his government had reached an agreement with pro-Russian separatists in eastern Ukraine, for the transfer of the bodies and so-called black boxes from Flight 17 to Malaysian representatives there, apparently achieved what pressure from far more powerful nations had failed to accomplish. The agreement is the result of an unusual spate of diplomacy by Mr. Najib, who held a series of secret telephone calls with Mr. Borodai. A person with a detailed knowledge of the negotiations said that Mr. Borodai concluded that he would only release the bodies and black boxes to Malaysia, although Malaysia would then transfer the bodies to the Netherlands and make the black boxes available for an international investigation. *p.s. Quietly, our Foreign Minister Anifah Aman left for Kiev the other day to ensure that the deal happens. Some of us were supposed to have a buka puasa with him this evening and are extremely happy and proud that he had stood us up! Godspeed!! It's better for Malaysia bodies return direct to Malaysia for our own investigation or autopsies..We need to do our own investigation to the causes of death by our own to get same credible result. alhamdulillah and fantastic job by the very patient najib.what more he has shown his campassion for the palestinian causes and bangsa moro peace deal.unlike the tin koso ng anwar who is currently fighting hard to cling to power via his future mb selangor wife.yucks anwar! Given the separatists' suspicion of the international investigators, I thought that it would be best for Malaysia to make a deal with the separatists to let a Malaysian investigation team in. Well, Najib did just that and it worked. Much better than musa hitam's elegant silence. It is actually sleeping on the job. Was there a quid pro quo? There's always a quid pro quo. Why else would an unelected leader of a ragtag separatist movement choose to play ball? Was Russia twisting arms in the background? DS Najib us a true world leader . Where others failed , he triumped . Well done Dato Sri . Keep it up . You are on the right track . The folks are with you always. Congrats to dato najib credit where its due! But not to that ma f**ker liberal minded Khairi Jamaludin and his rabid stoooooopid supporter which show undivided unparalled support to western country! Further more, what the HELL did his umno youth doing create RUCKUS in front of Russian Embassy? Are you trying embarrassed us (the bumiputra) and at the same time sleeping with a fascist and racist (to the core) enemy namely a party called Dog and Pig? Finally Najid woke up?. If yes than that great NEWS to Malaysia. Start clean un the man made mess in the coutry. On behalf of the Rakyat we are getting frustrated with all the fuss created by BN and PR. Clean up Khazanah and take to court those who incharged of MAS (Khazanah people and the Top MAS mhgt with FAT salaries) for failure to turn around MAS! err. am I too early to be too sure on the wake up? I am not of the opinion to hand over the black boxes to international investgators. We have to be extra cautious here. Our plane just being blown in the sky. Our sovereignity is being violated. Our dignity took a serious beating. Just invite them; the investigative teams to come down here to do their jobs. And the black boxes have to be keep here in Malaysia. They shouldn't be allowed to leave the country. The black boxes could not be allowed to leave the Malysian soil. Trust no one but yourself. Whatever took place in is the result of the global pressure and not from Najib alone. If it was his lone effort nothing would have happened, therefore cease giving the credit on the return of the two black boxes to Najib. Nothing would have happened if that was the case ! Why is MAS still in lots of financial troubles when it costs more to fly with it subsidiary, Firefly, from Singapore to Ipoh than to fly to Hong Kong or even to China from Singapore, how come ? Thank you, Mr Prime Minister Sir! So much that one can do. We are just a small fry compared to US..Russia..France..England and many Middle Eastern countries but what Najib has done is an eye opener to them. Kudos to Najib once again. Can he do another 'quiet' one for MH370? 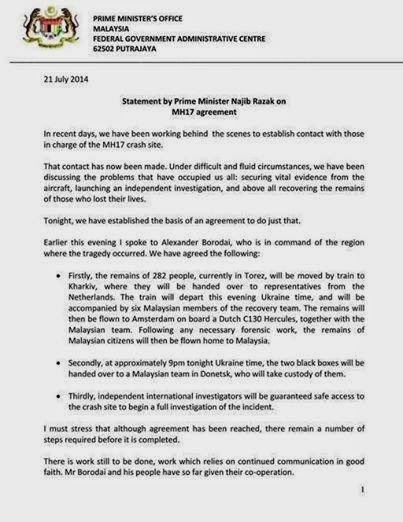 Did you notice that the cargo manifest of MH17 was put up on the airline's website but not the one for MH370? This record, no need to scour the Indian Ocean and waste money. Its available and has been passed to the government by the airline. Yet, it has not been made public except for a verbal announcement that it was mangosteens, batteries and unidentified cargo. You tell me - which airline accepts unidentified cargo on its aircraft? What is the reason for classifying like this? You should QUIETLY tell the Chief Executive that it is not good for Malaysia's reputation to state like this. Better come clean on the cargo manifest as this info is within Malaysia. He need not deal with international terrorists or rebels. Just try and get the info made public and then we can have a refresh of what could have gone wrong with MH370. You nak all to give accolades for a job well done, but not willing to strike hard & remedy the glaring loose ends on MH370?